The Egyptian Pyramids are colossal structures used by the ancient world for religious purposes. The largest and most remarkable of the pyramids occur in several groups on the west side of the Nile extending for a distance of twenty five miles reaching as far as Cairo (the capital city). The are built from hard limestone and large blocks of limestone, especially on the outside surface. They date from 3000 BC to 2300 BC. Great skill was needed to quarry these large blocks, transport them and then place them in position. The Ancient Egyptians were very well organised and they required a good understanding of technology, science and mathematics to enable them to build what has become known as one of the wonders of the ancient world. 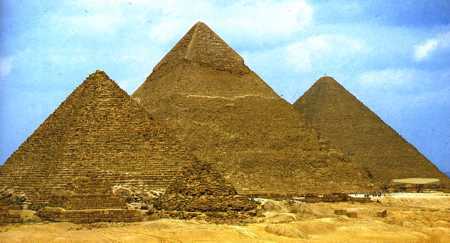 One of the first tasks of the pyramid builders who constructed the three pyramids shown above, was to build a track on which they could drag the large blocks from the quarry in the Arabian Hills to the River Nile where they were ferried up to the construction site. The work went on in three monthly shifts with one hundred thousand men in a single shift. 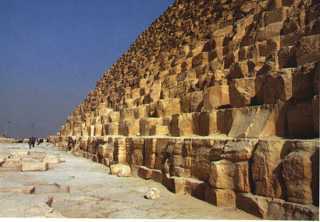 It took ten years to build the track It took the same number of men twenty years to complete the Cheops pyramid. Originally the pyramids were smooth on the outside but through the thousands of years since construction this has disappeared revealing the tiers or steps underneath. Each tier is about a metre in height. The pyramids we built by kings as tombs or memorials of themselves and it is thought that they were started at the beginning of each reign and that the height corresponded with the length of each reign. The pyramid of Cheops was originally 146 metres high and the technology for lifting the blocks into position was well designed. What technology was used to lift the blocks into position ? 1. Draw a map of Egypt and mark show the location of the city of Cairo. 2. Design a mechanical crane capable of lifting blocks similar to the ones used to build the pyramids. Remember, the Ancient Egyptians could only use human or animal power. Your design may include some form of levers and pulleys. 3. Using the internet as a resource, find information about other well known structures or buildings constructed by the Ancient Egyptians. Write an account of some of these examples.